At the time of his death in 1820, Benjamin West was the most famous artist in the English-speaking world and celebrated throughout Europe. From humble beginnings in Pennsylvania, he had become the first American artist to study in Italy, and within a few short years of his arrival in London had been instrumental in the foundation of the Royal Academy of Arts and been appointed history painter to King George III. However, West’s posthumous reputation took a critical mauling, and today he remains one of the most neglected and misunderstood of Britain’s great 18th-century artists. 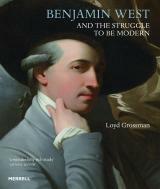 As Loyd Grossman asserts in his new book, West was in the vanguard that created neoclassicism and romanticism, and among the first painters to represent the exciting and inspirational qualities of contemporary events, as opposed to events from the biblical, classical or mythological past. Most significantly, his best-known painting, The Death of General Wolfe, was a thrilling, revolutionary work that played a role in changing the course of art. In a lively, immersing text that situates West in the midst of Enlightenment thinking about history and progress, Grossman explores both why Wolfe has exercised such a magnetic grip on our imaginations for almost 250 years, and how, with this artwork, West helped to lay the foundations of a modern attitude that has affected the way we live and think ever since. Loyd Grossman is a broadcaster, historian and heritage campaigner who has presented a wide range of TV programmes, from Through the Keyhole and MasterChef to Loyd on Location and History of British Sculpture. He is Chairman of both the Churches Conservation Trust and the Heritage Alliance, Deputy Chairman of the Royal Drawing School and President of the National Association of Decorative and Fine Arts Societies (NADFAS). He was educated at Boston University, the London School of Economics and the University of Cambridge, where he received a doctorate in the history of art. Loyd Grossman’s fascination with Benjamin West’s Death of General Wolfe provides a wonderfully rich study, not just of the painter and his work, but above all of a great social, political and intellectual tipping point in art. An admirable, up-to-date and wide-ranging account, making clear how important West was, not just as the first American artist to make a career in London, but also as an artist who first introduced ideas of the Enlightenment to history painting. Lavishly illustrated and beautifully produced. An engaging new study … provides fascinating new insights into West's painting. Grossman gives us an accessible synthesis of Benjamin West's formative role in the rise of contemporar history painting, and a detailed study of 'The death of General Wolfe'. With 125 illustrations lavishly printed in colour, this book provides an enjoyable scholarly introduction for art enthusiasts to deeper inquiry about Benjamin West.